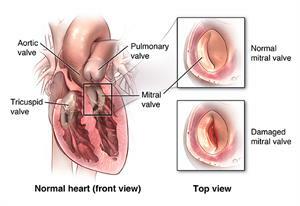 Your mitral valve is a small but essential part of your heart. When the valve is open, it enables blood to flow from your lung and left atrium to your left ventricle. When the left ventricle contracts to pump blood into your body, the mitral valve closes to prevent blood from leaking backwards into your lungs. 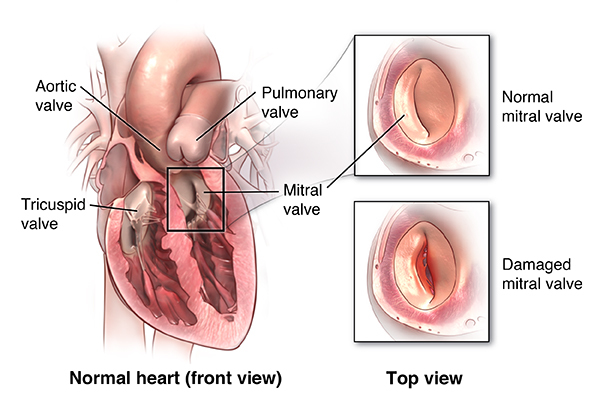 If your mitral valve is deformed, becomes damaged, or doesn’t work properly, you may need surgery to repair it. Open-heart surgery is the traditional procedure for mitral valve repair though other less invasive valve repair options are also available. This involves a deep incision that goes through your breastbone. The most common reason for mitral valve repair surgery is to correct a leaking valve, also known as mitral regurgitation or mitral insufficiency. This leaking can occur because of a heart defect you were born with, damage from a heart attack, advanced age, or even a bacterial infection in your valve. 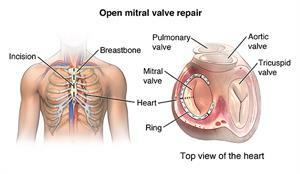 Sometimes, a mitral valve needs to be repaired because it is too stiff to open properly (mitral stenosis). You might have been born with this stiffness, but it can also occur because of damage from rheumatic fever. In general, the outcome is better when a surgeon repairs, rather than replaces, your mitral valve. However, if your valve has too much damage, your surgeon may need to replace it. Your doctor will perform tests before your surgery to determine which treatment is best for you. 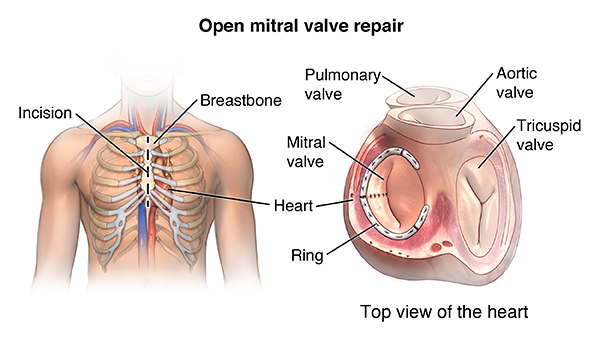 Open-heart mitral valve repair is major surgery that requires general anesthesia (your doctor will give you medicine to make you fall asleep and prevent you from feeling any pain). Any general anesthesia involves the risk of heart or brain injury. Major surgery also carries the risk of blood clots forming during or after surgery. These clots can break free and travel to your lungs (pulmonary embolism), to your brain (stroke), or block blood flow as the clot becomes lodged in other vessels. There may be additional risks, depending on your specific medical condition. Be sure to discuss any concerns with your doctor before the procedure. Before mitral valve repair surgery, your medical and surgical team will conduct a complete evaluation to determine the repairs that you will likely need. 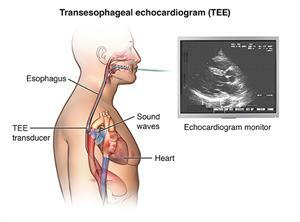 You will probably have a transesophageal echocardiography (TEE). This is an imaging test done through your esophagus to better visualize your valve. Your surgeon will explain the procedure and ask if you have any questions. In addition to a complete medical history, your surgeon may request a complete physical exam to ensure you are in good health before undergoing the procedure. You may undergo blood tests or other diagnostic tests. You may be asked to shower the night before surgery and/or the morning of surgery using an antibacterial scrub to prevent infection of the incision sites. If you are pregnant or suspect that you are pregnant, you should tell your surgeon. Tell your surgeon if you are sensitive to or are allergic to any medications, iodine, latex, tape, or anesthetic agents (local and general). Tell your doctor if you have a history of bleeding disorders or if you are taking any anticoagulant (blood-thinning) medications, aspirin, or other medications that affect blood clotting. It may be necessary for you to stop some of these medications prior to the procedure. Your doctor may request a blood test prior to the procedure to determine how long it takes your blood to clot. You will be asked to empty your bladder prior to the procedure. An intravenous (IV) line will be started in your arm or hand. You may be given a dose of IV antibiotics before the procedure starts. Additional catheters will be inserted in your neck and wrist to monitor the status of your heart and blood pressure, and to get blood samples. Alternate sites for the additional catheters include under the collarbone, and the groin. The doctor will make an incision (cut) down the center of the chest from just below the Adam's apple to just above the navel. The sternum (breastbone) will be divided in half with a special operating instrument. The doctor will separates the two halves of the breastbone and spread them apart to expose the heart. To do the valve repair, the heart must be stopped to allow the doctor to perform the very delicate procedure. Tubes will be inserted into the heart so that the blood can be pumped through your body by a cardiopulmonary bypass machine. When the heart has stopped, the procedure will begin. The procedure performed will depend on the type of valve problem that exists, for example, separation of fused valve leaflets, repair of torn leaflets, and/or the reshaping of valve parts to ensure better function. Once the procedure is done, the blood circulating through the bypass machine will be allowed to reenter your heart and the tubes to the machine removed. Your heart will be shocked with small paddles to restart its electrical activity. Once your heart is beating again, the doctor will observe the heart to assess the function of the heart and the valves. After the surgery, you may be taken to the recovery room before being taken to the intensive care unit (ICU) to be closely monitored for several days. Alternatively, you may be taken directly to the ICU from the operating room. You will be connected to monitors that will constantly display your electrocardiogram (ECG) tracing, blood pressure, other pressure readings, breathing rate, and your oxygen level. Heart valve repair surgery generally requires an in-hospital stay of several days or longer. You will most likely have a tube in your throat so that your breathing can be assisted with a ventilator (breathing machine) until you are stable enough to breathe on your own. As you wake up from the anesthesia more and start to breathe by yourself, the breathing machine will be adjusted to allow you to take over more of the breathing. When you are awake enough to breathe completely by yourself and to be able to cough, the breathing tube will be removed. The stomach tube will also likely be removed at this time. After the breathing tube is out, your nurse will assist you to cough and take deep breaths every two hours. This will be uncomfortable due to soreness, but it is extremely important that you do this in order to keep mucus from collecting in your lungs and possibly causing pneumonia. You will be given pain medication if you are hurting, and you should ask for the medication before you become extremely uncomfortable. Your nurse will show you how to hug a pillow tightly against your chest while coughing to help ease the discomfort. You may be on special IV drips to help your blood pressure and your heart and to control any problems with bleeding. As your condition stabilizes, these drips will be gradually decreased and turned off as your condition allows. Once the breathing and stomach tubes have been removed and your condition has stabilized, you may start liquids to drink. Your diet may be gradually advanced to more solid foods as you tolerate them. When your doctor determines that you are ready, you will be moved from the ICU to a postsurgical unit or acute care unit. Your recovery will continue to progress. Your activity will be gradually increased as you get out of bed and walk around for longer periods. Your diet will be advanced to solid foods as you tolerate them. Arrangements will be made for a follow-up visit with your doctor. Once your doctors feel that you have recovered, you will be discharged home. Follow all your instructions for medications, pain control, diet, activity, and wound care. Make sure to keep all your follow-up appointments. Avoid any heavy lifting. Your surgeon will provide a timeline for certain lifting restrictions. Gradually resume normal activities as instructed (ask your doctor about driving, working, and sexual activity). You won’t be able to drive a car for a period after the surgery to allow for healing of the breastbone (sternum) and muscles of the chest wall. Watch your wounds for any sign of swelling, redness, bleeding, or discharge and report these to your medical and surgical team. Let your doctor know about any increasing pain, fever, chest pain, or shortness of breath. Eat a heart-healthy diet and maintain a healthy weight. Avoid foods high in fat, cholesterol, and salt. Try to eat a diet rich in fruits, vegetables, and lean meats. Don't smoke and avoid all tobacco products including electronic cigarettes. Keep in mind that your recovery can be slow; it may be anywhere from 4 to 6 weeks or longer before you start feeling better. The outlook after mitral valve repair is very good, although everyone’s situation is different. However, if your surgeon uses more complicated procedures to repair your mitral valves, or if rheumatic fever has damaged your valve, you may have a less favorable outlook. If you need dental work in the future, your doctor may give you antibiotics to prevent infection of your mitral valve. Before you have any dental procedure, always tell your dentist you have had valve surgery. Your doctor may suggest that you begin a cardiac rehabilitation program, which gradually reintroduces you to a normal lifestyle. Cardiac rehabilitation begins in the hospital with simple walking, and progresses to the development of a regular exercise routine and a nutritious diet. Committing to healthier habits can prevent future heart problems.